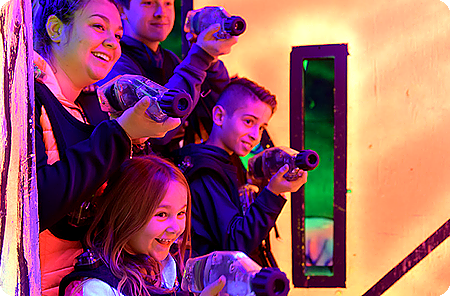 Zap Zone is designed for you…kids, teens, parents, families, corporate events, associations, school groups, and organizations – experienced or novice. 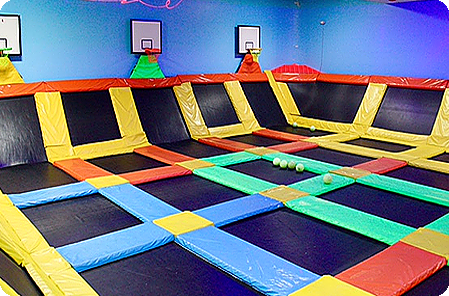 The recommended minimum age is 5 years old because the equipment is one size fits all. Each player is provided with a phaser and computerized vest after being thoroughly briefed on the rules and strategies of the game. Each vest has a unique name or id. Your objective is to deactivate the opposing players and their base with the use of your phaser, as a sophisticated computer program tallies your individual and team scores. The team that accumulates the most points wins. At the end of the game, you are led out of the arena to analyze your personal score sheet and plan for the next adventure. 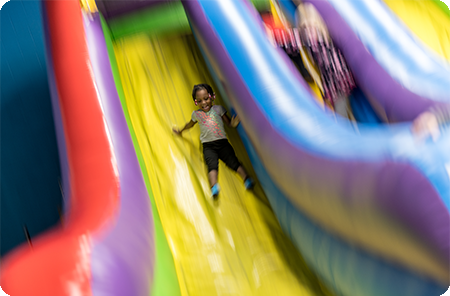 Surround yourself with 360 degrees of excitement! 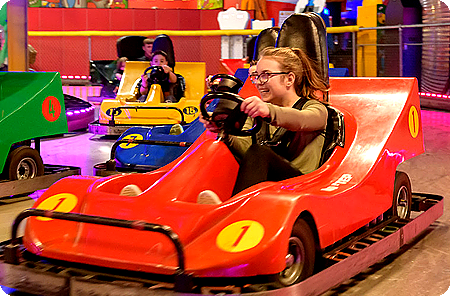 Surround yourself with 360 degrees of excitement in Zap Zone’s Bumper Cars! 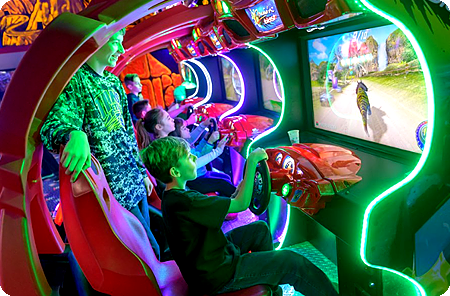 Cushioned by a rubber inner tube that surrounds the car, two hand held levers control your motion as you spin, bump and slam your way to fun. Minimum height requirement of 44″ tall. You won’t find such a dynamic mix of the latest video, arcade and redemption games anywhere else. 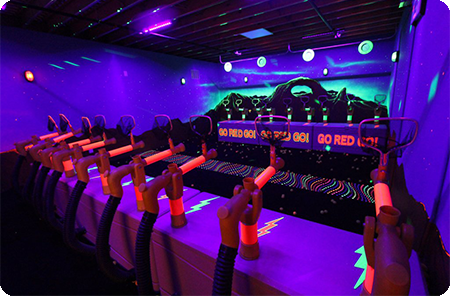 Our physical and interactive games are selected to push you and your friends to the very limits of fun and excitement. 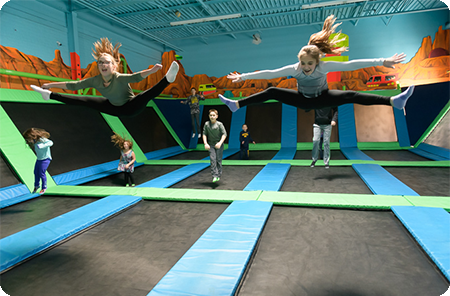 The redemption games award points in the form of tickets that you can put towards prizes for the whole family. Tokens must be used in the arcade, hold no cash value and cannot be exchanged for cash. Dive through the ocean, take a ride through a jurassic forest, or fight your way out of an apocalyptic future. 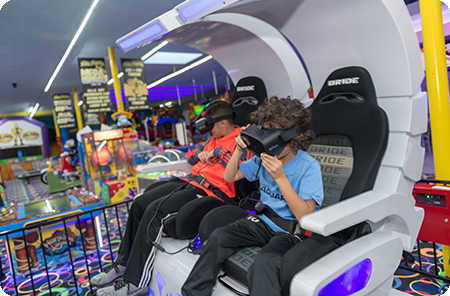 The choice is yours with our brand new Virtual Reality Ride experience. 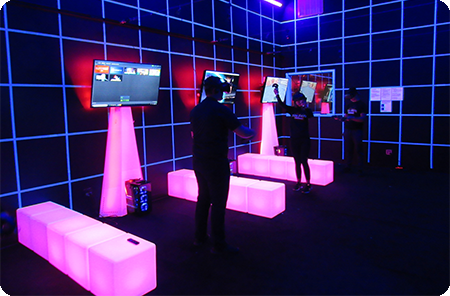 With the latest Virtual Reality equipment available, and a multitude of games to choose from, you can immerse yourself in worlds that you never thought possible. 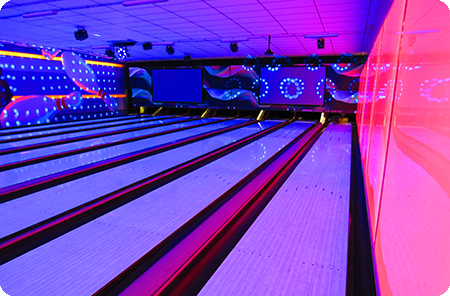 Check out our fully equipped Bowling Alley! Exclusively at our Battle Creek location, don’t miss this fully equipped bowling experience with Cosmic Bowling, arcades, and more. 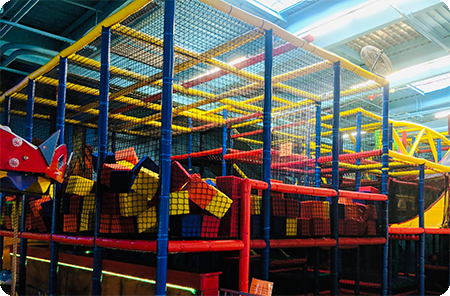 Climb, crawl and slide your way through this soft indoor play-scape! 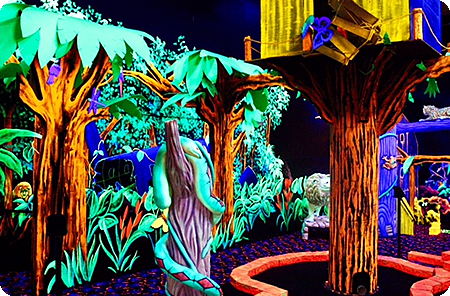 NEON COLORED MINIATURE GOLF…ALL INDOORS, AND GLOWING UNDER BLACK-LIGHTS! Our fully themed course starts out in fun locales like the streets of New York City, a Carnival, or the Pyramids of Egypt then takes a dive into an underwater adventure complete with dolphins, sharks and sunken treasure! Next, you emerge from the water into a tropical jungle lush and green and teaming with animals. Finally you finish the course in a prehistoric world filled with lava, flying Pterodactyls, and a 40-foot Brontosaurus! 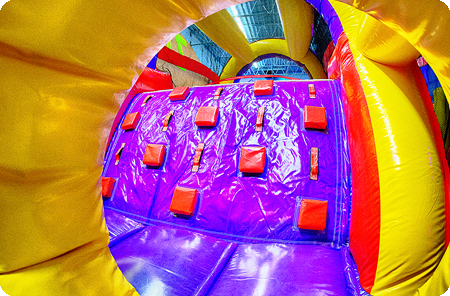 With themed bounce houses, slides, and more, these inflatables are perfect for kids 12 and under. 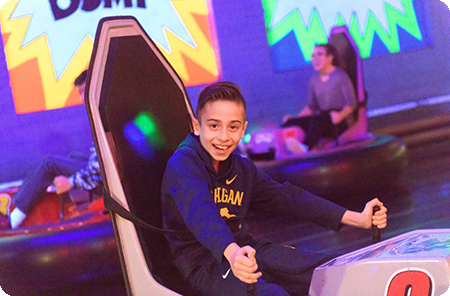 COME AND EXPERIENCE THE THRILL OF 14,000 FEET OF INDOOR ELECTRIC GO-KART ACTION! With both large and kiddie cars available, everyone can experience the trill of the road! To drive the large cars independently, you must be 9 years old or older and be 54″ or taller. Of the nine large cars in each session, two of them are doubles. A driver 16 years or older may take a passenger as young as 3 years old in a double car (only one ticket required). To drive the kiddie cars, you must be 5 – 8 years old. Kiddie cars and large cars do not run together at the same time. Strict safety rules are enforced – the better you drive, the faster you’ll go! 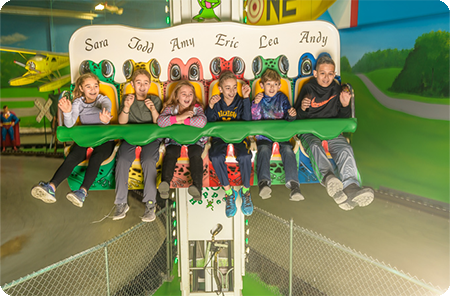 Take a ride on this lilypad leaping adventure! Frog Hopper jumps you right up to the ceiling then bounces you right back down again. Perfect for little frogs everywhere. Cannon Blaster is a fast paced team challenge game where players drop foam balls into their air cannon to launch over to the opposing team! Music Videos & DJ’s Play Your Favorite Tunes! The fun begins when the lights come on, with a huge jumbo vision playing the latest music videos, while our DJ plays your favorite tunes!